The 36th session of the UN Human Rights Council will take place from the 11th to the 29th of September 2017. Find below information about anticipated sexual rights-related resolutions, panels and reports, UPR outcomes, and parallel events taking place during the 36th session. Report of the Special Rapporteur on the rights of indigenous peoples. Report not currently available. Outcomes from the 27th session of the Universal Periodic Review (UPR) will be adopted during this session of the HRC. The 27th session of the UPR was held from the 1st to the 12th of May 2017. Fourteen countries were reviewed: Algeria, Bahrain, Brazil, Ecuador, Finland, India, Indonesia, Morocco, Netherlands, Philippines, Poland, South Africa, Tunisia, and United Kingdom. 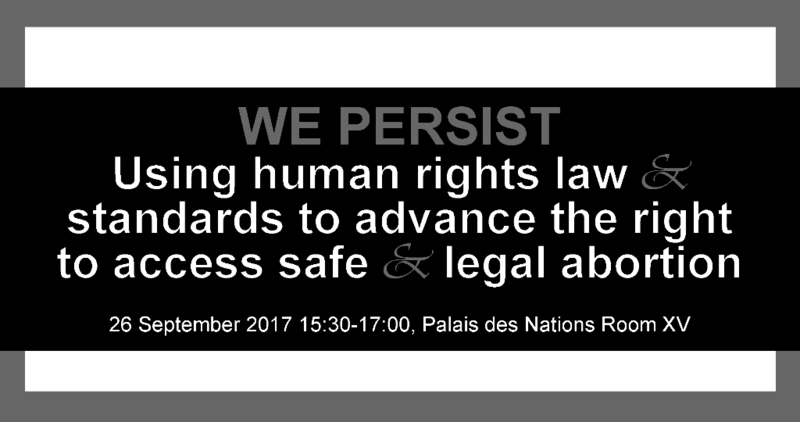 15:30-17:00, Room XVIn support of the September 28 Global Day of Action for Access to Safe and Legal Abortion, the Sexual Rights Initiative is organising an event during the 36th regular session of the Human Rights Council. The event will highlight the ways in which States, civil society, the UN system, and others can use human rights law and standards to advance the right to access safe and legal abortion. It is intended that this exchange of practices and experiences will inspire further action and collaboration among States, development partners, and civil society towards realising abortion related rights for all.